Fingerprint-proof finish resists smudges keeping stainless steel shiny and attractive. A separate knife block ensures safety and prevents the risk of cutting yourself. A unique wine glass holder easily accommodates 4 large wine glasses, at the same time, taking minimum space. Rather big dimensions will require some extra space on the kitchen countertop. The smart design of Simplehuman dish rack includes several intended-purpose holders making the drying process not only quick and efficient but also appropriate in terms of hygiene. Now all your dishes will shine with cleanness! 21.8" x 20.2" x 14.3"
A slide-out tray provides additional drying space perfect for glass items. And you can easily hide it under the rack when not in use. The water can accumulate in the drip-tray leaving faint traces of smudges. A high-capacity model offers the utmost efficiency and usability. 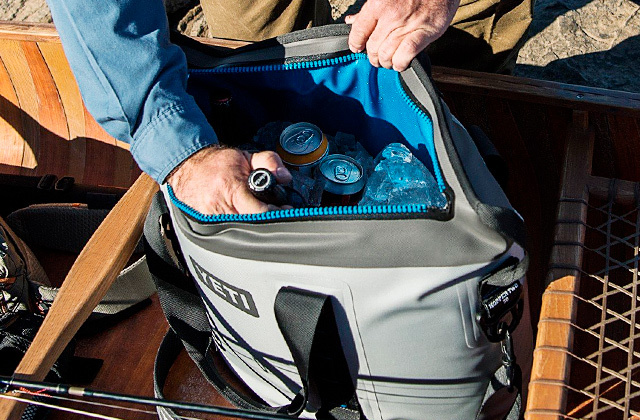 It will easily accommodate plates and glasses after big gatherings. 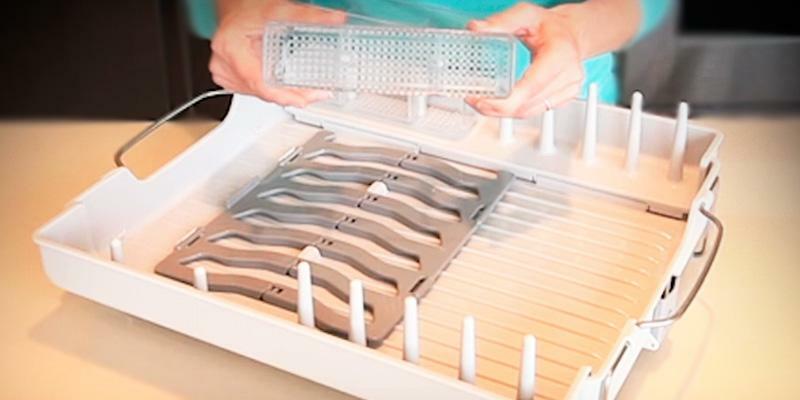 A polder dish rack will add comfort to dish drying. 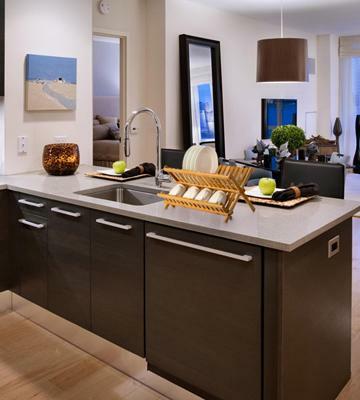 A graphite or white design will fit the decor of any kitchen. 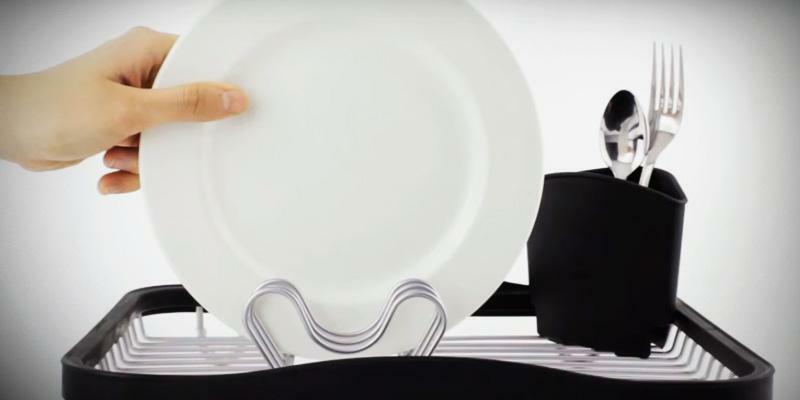 A foldable dish holder creates a common space for cookware drying. 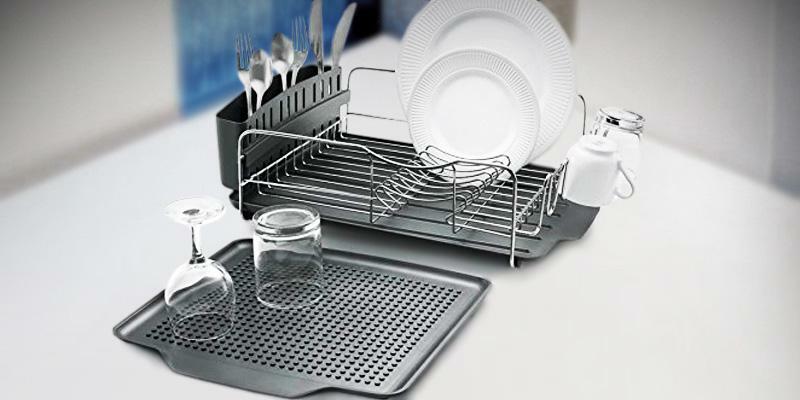 Owing to stainless steel convenient handles, you can easily move the dish rack even with the dishes stocked. The plate slots are a bit narrow for soup bowls. 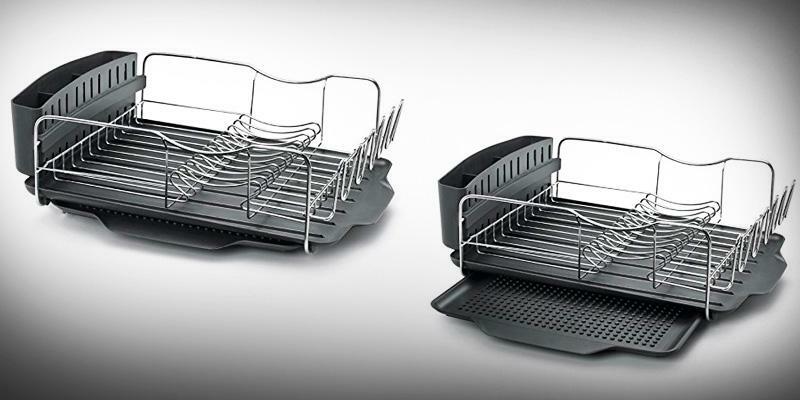 OXO designed this highly functional dish rack keeping versatility and usability in mind. 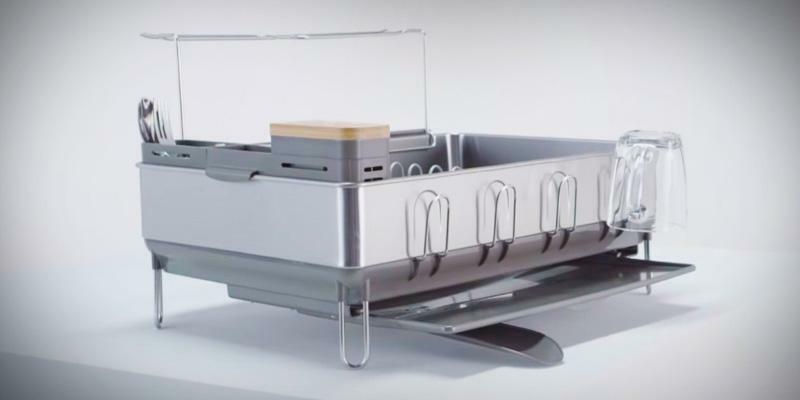 In this immaculate model every single detail has its purpose ensuring efficient drying of plates, cups, bowls, and other utensils without traces of spots and smudges. It will securely hold even brittle and fragile cookware. This model folds flat with a thickness of only 1.5 inches. Hence it is perfect for a compact upright storage in the cabinet next to your cuttings boards or baking pans. Utensil holder is not included. Entirely made of durable and practical bamboo wood, this simple yet stylish model will definitely add some elegance to your kitchen and become an eye-catching and functional kitchenware. 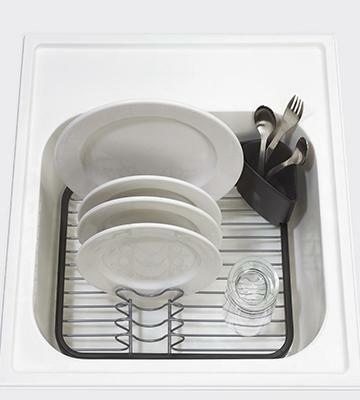 Umbra dish rack was originally designed to rest in the bottom of the kitchen sink for convenient and mess-free drying. Placed in a sink, it will take literally no extra space in your kitchen. Meanwhile, you can place this model on the countertop either. Just mind putting an additional drip tray under it. The drying rack comes without a cup and glass holder. Despite its fairly simple design, this compact model is an excellent space-wise solution for efficient cookware drying. 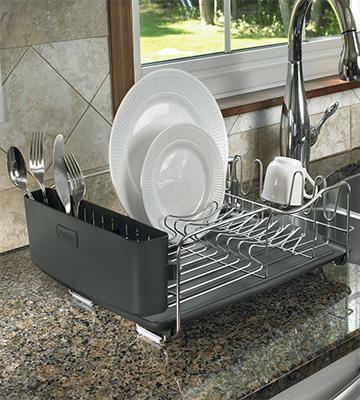 With unbelievably simple yet functional Umbra dish rack, you won't have piles of dishes on your countertop! It is an outstanding choice for a small kitchen and for those who prefer minimalistic and modern home design. This model by Simplehuman is a Rolls Royce among the dish racks that boasts smart design solutions for your ultimate convenience. 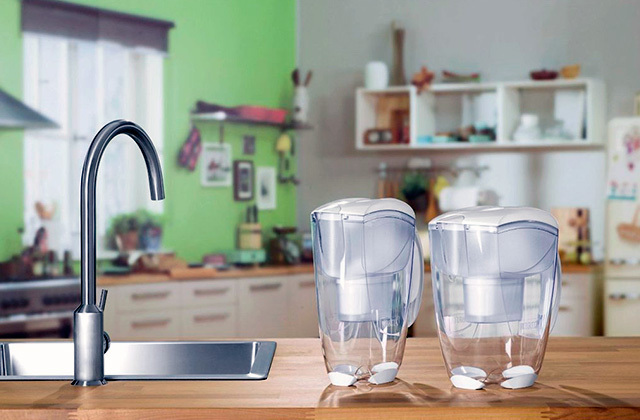 For example, a unique drain system efficiently siphons the water from the dishes to the drip tray and drains it to the sink by means of a spout. This model is originally designed with a removable swivel spout to drain the water right into the sink and not on the countertop. 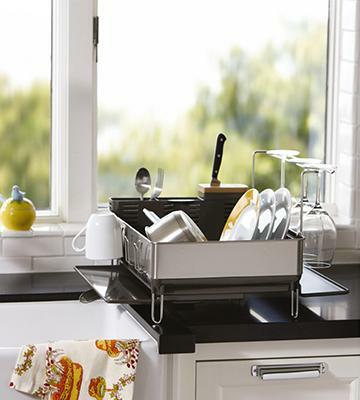 Besides, you can move the spout to re-position your dish rack, whatever suits your space. Along with the main plates holder, this model has a cup holder (up to 4 cups) with a pull-out drip tray as well as a knife block made of natural bamboo that will ensure a quick drying and prevent risks of injuring yourself. Additionally, a utensil holder is fitted with a compartment for different flatware. And one of the most distinctive benefits of this model is a wine glass holder suitable for 4 extra-large wine glasses. This holder is removable and allows quick glasses drying without unattractive water spots. 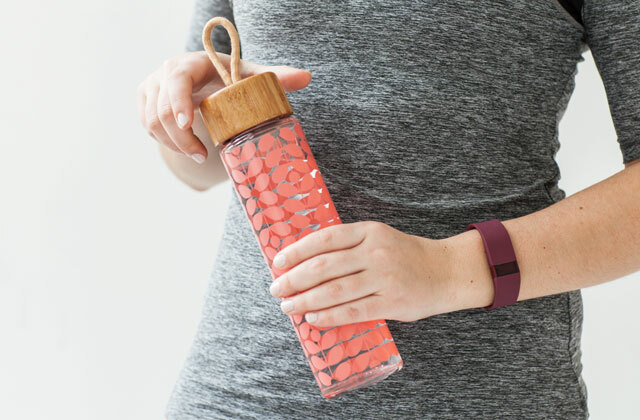 Forget about the mess and water on your countertop! Now your dishwashing process will be strictly and conveniently organized: you wash the dishes and the dish rack will dry it quickly and efficiently. 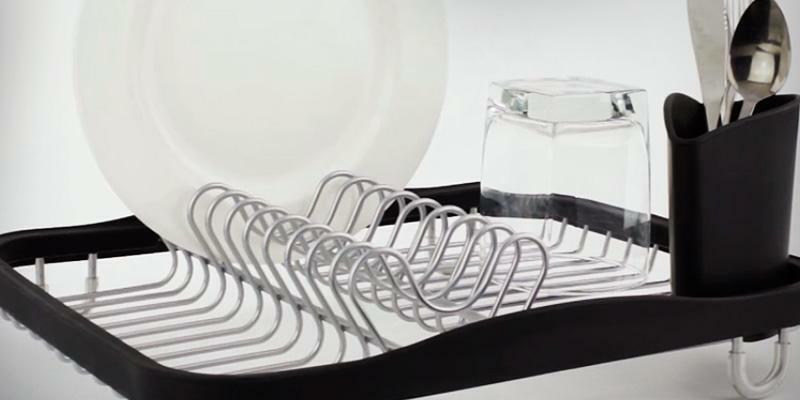 Speaking of dish rack installation, you can easily place it on any surface without the risk of scratches and attrition while the non-skid rubber feet ensure an outstanding steadiness. Fingerprint-proof stainless steel design keeps an attractive shiny look of your dish rack that will perfectly match other modern kitchen tools and appliances. However, besides the stylish design, hygienic safety is of the utmost importance as the dish rack is in constant contact with dishware. 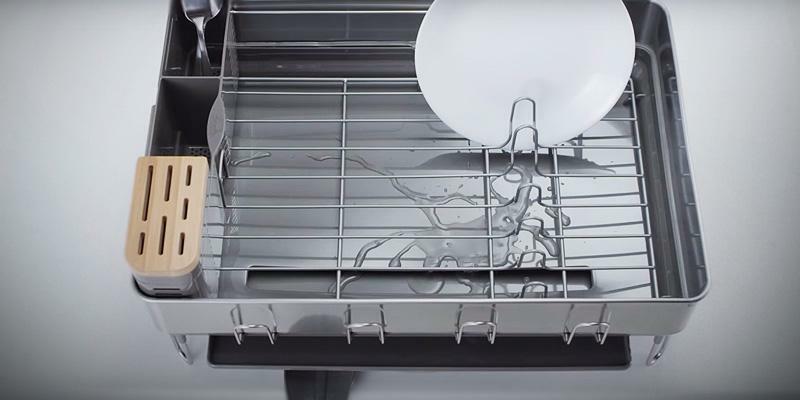 But the Simplehuman worked out every single detail and your dish rack comes with a specific coating to prevent residue buildup and bacteria growth. Besides, you can easily take out the interior wire tray and clean it when needed. It is obviously one of the best models that will make your cookware and glassware shine with cleanness and add to the design of any modern kitchen! The flatware history goes back to the ancient times. First, people invented a knife. 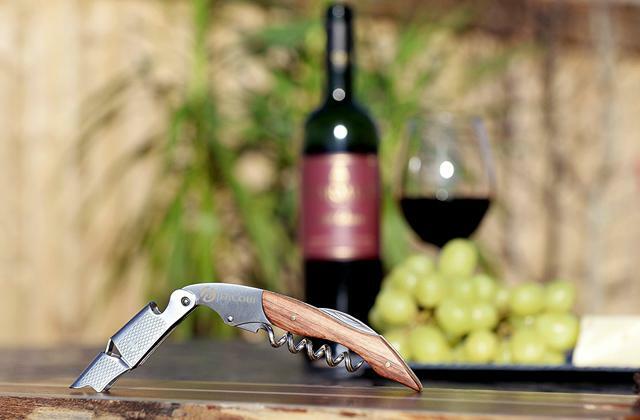 Knives were made of stone and used as a weapon for hunting, fishing and as a tool for different household activities. The decades had passed before our predecessors started using this tool for cooking. In the 15-16th centuries, the noblemen used the knives with blades made of precious metals and handles made of fine woods. The spoons were invented a bit later. Though the scientists still argue on the issue when people started using spoons, some findings evidence that first samples were made of clay, wood, seashells, fish bones and even nutshells. As for the precious metals, most often ivory and gold were used to make spoons. A fork is a flatware that was the last to appear. First fork prototypes appeared over 2,500 years ago. They were found in the territory of Ancient Greece. It is interesting that ancient forks had 2 prongs and in most cases, they were used to pin the meat and set the table. The forks with 4 prongs and a curved handle similar to modern flatware appeared only in the 18th century. Simplehuman Wall Mount Grocery Bag Dispenser will become a perfect match to your Simplehuman dishrack made in a similar sleek stainless steel design. The dispenser holds up to 30 plastic grocery bags and mounts to the wall with the screws or an adhesive tape. 10-year warranty evidences the premium quality. Thanks to its compact size (19”x14”x6”), this nice-looking elegant model will easily find its place even in rather small kitchens. 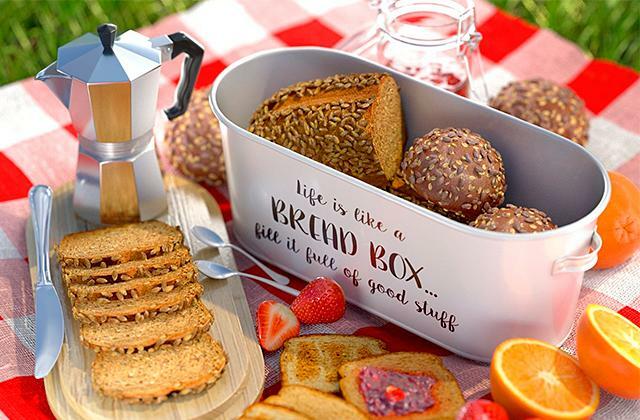 It has 3 holders: a dish holder that can accommodate up to 10 plates at a time, a cutlery holder with split compartments to dry and store different flatware separately, and a cup holder for cups, mugs, and glasses. At the first sight, you won’t be impressed by available drying space as there is a lot of higher capacity models. 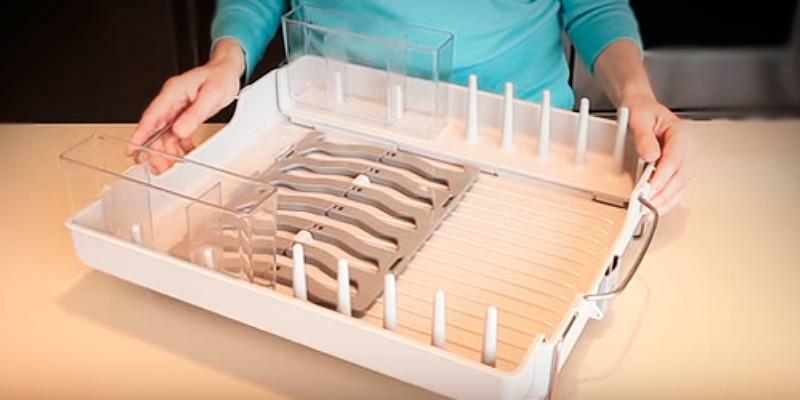 But Polder dish rack has an ace in the hole – a pullout tray (14.25”x13.25”) ensuring some extra space enough for drying both plates of different diameter and any glassware. Hence, even after a picnic or a friendly get-together you can easily place the numerous plates, glasses and cutlery on this dishrack. 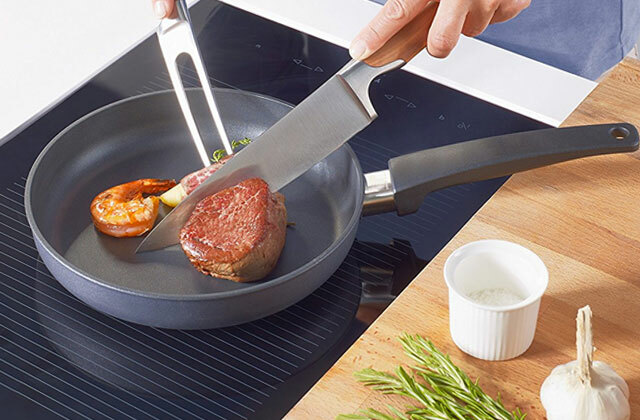 It will become a stylish and highly functional appliance in your kitchen. It is commonly supposed that freestanding (open type) dish racks should be placed on the countertop or any other kitchen surface and no other way. To dismantle this stereotype it is worth mentioning that you can also install your dish rack in a kitchen cabinet not only to dry but also to conveniently store your dishes. It could become a space-wise solution for small kitchens and a decent alternative for those who simply do not like piles of dishes on the countertop. The main thing is that a cabinet should be big enough for drying rack installation and well-ventilated for efficient drying. Polder dish rack is an excellent model wherever you place it. And one more handy tip! While installing the dish rack in a cabinet, you can use a removable plastic drying tray separately on the countertop for added drying space. You will surely agree that hardly there is a person who honestly likes to wash the dishes. However, according to a research the process of washing plates and flatware after a meal is an efficient method to relax and shake off the stress. In the Florida State University, a group of 51 students participated in the following experiment. Before dishwashing, half of the students read a simple text describing dishwashing process while the other half read a short mindfulness dishwashing passage. The research showed that people who approached dishwashing with awareness (focused on the soap smell, water temperature or dishes materials) were able to reduce the stress level up to 27% and felt a rush of inspiration. Of course, it is a small-scale study and if replicated the experiment might have different results but it is clear that if we mindfully approach simple activities we can possibly reduce the stress and improve our psychological state. If you are a passionate cook, you surely know that the final results to a great extent depend on accuracy of the ingredients ratio. 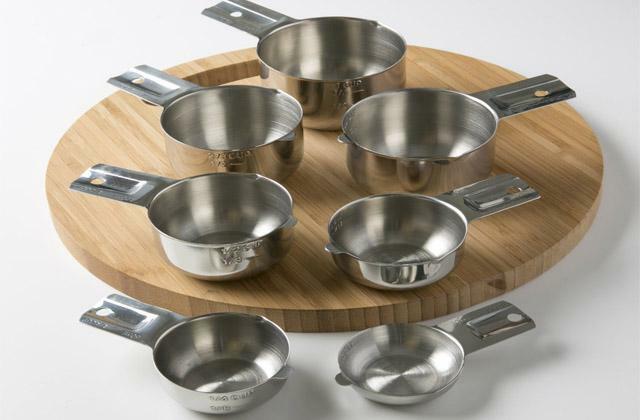 Hence, we recommend checking the Measuring Cups by KitchenMade. 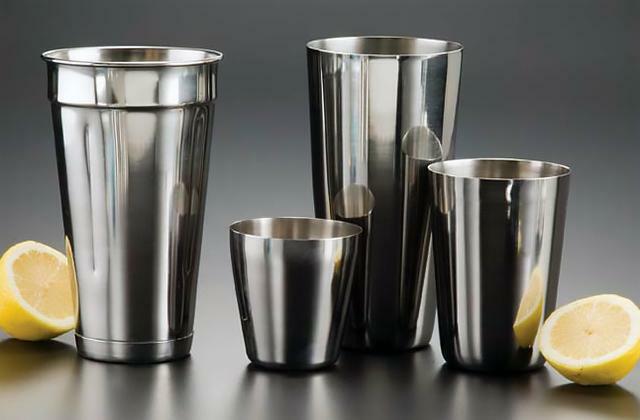 This brilliant set including 6 different stainless steel measuring cups is FDA-approved and is absolutely safe for contact with food. 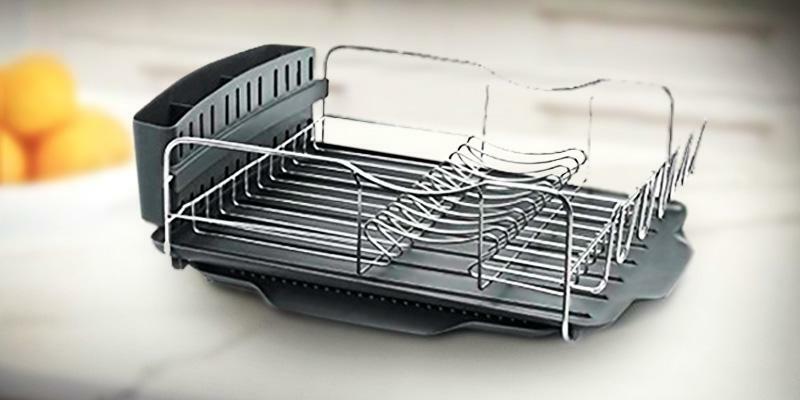 OXO Foldaway dish rack will really impress you with its collapsible design allowing it to accommodate any dishes. 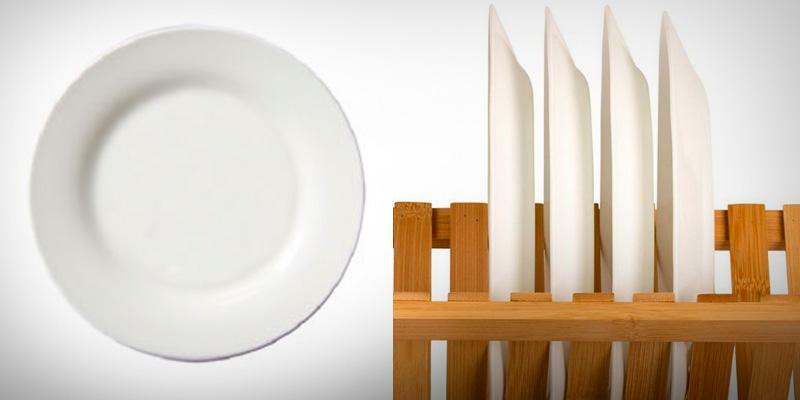 You can raise the dish holder to hold the plates upright for quick and efficient drying. If you need a room for large bowls, pans, and other cookware simply fold down the plate rack. Two utensil holders with split compartments have a generous capacity and are removable offering more space for cups, mugs, and glasses. 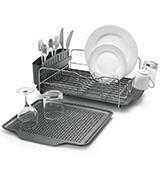 The dish rack is made of durable and safe plastic while stainless steel handles allow for convenient moving the dish rack even with the dishes inside. Another handy option worth mentioning is a draining system. To prevent water accumulation in the drip tray and drain directly into the sink just put the dish rack near the sink, fold out the legs and open the spout. When not in use, the drying rack folds flat to amazingly compact dimensions (19.4" x 12.5" x 2.875”) for upright storage offering a valuable extra space on your countertop. We can state with confidence that this smart dishrack is one of the most versatile models that will save your time and kitchen space. Compact, convertible and configurable just like you need! OXO is dedicated to providing innovative consumer solutions to make our everyday life easy and comfortable to the maximum. The company objective is to consider the needs and desires of young and old, male and female individuals. 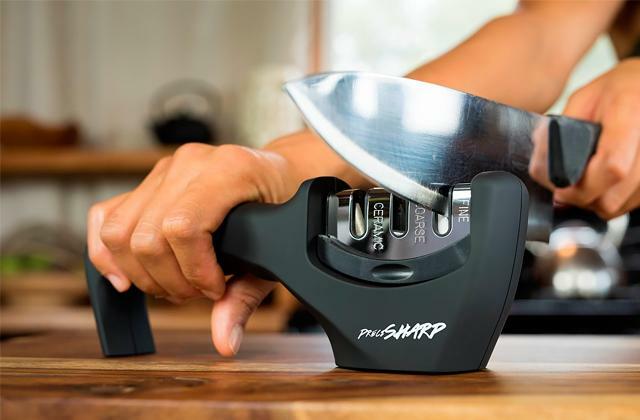 Moreover, OXO even designs and tests the products to suit both the righties and lefties that is the best evidence of the company ultimate care of its customers. Such comprehensive approach supported by the logo “Question everything” outlines the company philosophy focused on close attention to details and universal design. An interesting fact is that in the OXO office there is a stand with different gloves and mittens. These are gloves lost by some passersby around New York. This stand is a reminder to the company specialists that the products they design should comfortably fit everyone despite the age, gender or habits. 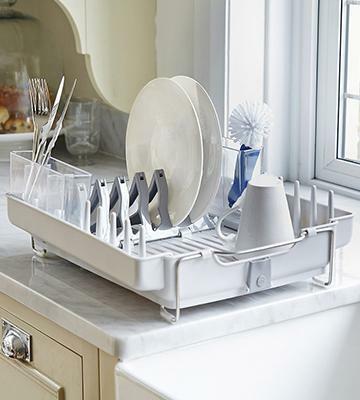 For mess-free dishwashing consider getting a handy OXO Sponge Holder. Made of stainless steel it can hold two sponges, scrubbers or steel wool pads. Open sides and ventilation holes at the bottom will ensure quick drying. 4 feet at the bottom prevent the holder from sticking to the surface even if it is wet. 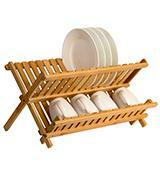 This extraordinary dish rack won’t leave you untouched because made of natural bamboo it looks very attractive. You’ll be interested to know that unlike other woods, a four-year bamboo is similar to steel in terms of hardness. If your kitchen is designed and furnished in a classic style this Saganizer wooden dish rack will perfectly fit your interior symbolizing comfort, harmony, sense of peace and warmth. Coming back to performance, it is notable that bamboo does not fade in direct sunlight, it is moisture resistant and you don't have to worry that eventually, the dish rack will lose its nice look. When unfolded the dish rack dimensions are 14”x13” and the overall height is 10 inches. Though it looks very simple, this model offers a generous capacity. The dish slots easily accommodate up to 14 large dinner plates while a cup holder will let you dry the cups, glasses and other small cookware. When you do not need the drying rack, it is foldable for easy storage. But it’s most likely that you won’t hide it for storage as this lovely dish rack will certainly become not only a functional but also a decorative addition to your kitchen! A plate is an essential and irreplaceable item in any household and any kitchen. We think you will be curious to know how the plates looked in the ancient times and how they have changed to the present day. The first plate prototypes were large leaves, gourd halves or even seashells. And it would be more appropriate to call them vessels. Later on, people discovered useful properties of clay and during Neolithic age, they started making clay bowls, jugs, and another dishware. First porcelain plates appeared in the 6th century AC. These were flat-bottom plates that spread over Europe only in the 14th century. In about one hundred years easy-to-make wooden plates became popular among peasants while the noblemen ate from tinware. And only in the 1800s, the plate became an indispensable attribute at any family. About the same time, decorative plates gained popularity as art objects. Over time, plates evolved and became more elaborate. Today, you can find the dishes in a variety of designs and made from different materials. Everyone can choose something to his or her liking. And it is a common knowledge that a beautiful clean plate can stimulate appetite and food will bring you more pleasure. A stylish and functional Flatware Organizer & Holder will allow for a convenient and efficient flatware drying. 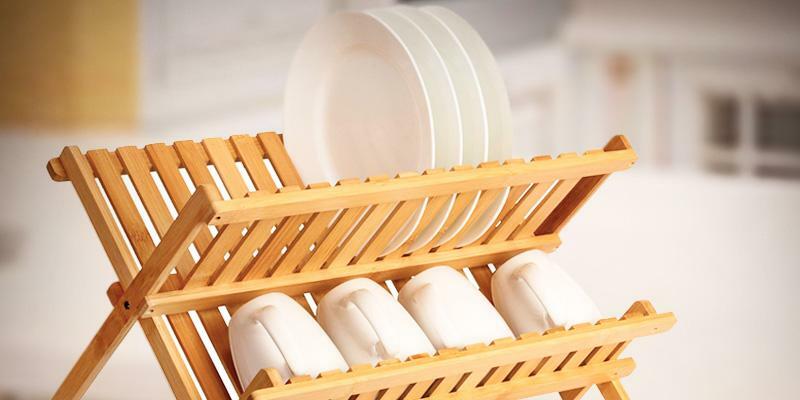 Made of bamboo by Trademark Innovations, this holder has drain holes for quick drying and metal clips to be fixed to a dishrack for a more complete and attractive look. Besides, the large dimensions and split compartments of the holder can accommodate a lot of flatware items. This handy drainer stands out from all other models. It is designed to dry your dishes right in the sink. 14”x11” dimensions will allow you to install it almost in any sink and with the height of 5.3 inches, it will not stick out of the sink even with the dishes in it. Of course, if necessary, you can place Umbra drying rack on the countertop and the rubber feet will prevent skidding, but remember about the drip tray to collect the water and protect the countertop. Besides, it is a stylish designer dish rack. It has a unique look because it was designed by a famous designer Hellen T. Miler specifically for Umbra. 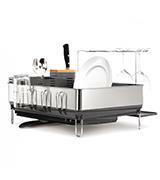 The appliance is made from premium quality plastic and first-class rust resistant stainless steel. 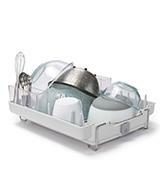 It will conveniently rest in the bottom of your kitchen sink for a neat and discreet plates, cups and utensils drying. All followers of minimalistic design solutions will definitely appreciate this modern, casual and functional design that will fit any kitchen confined in space! Do you Have any Creative Ideas? Share Them With Umbra! Umbra often collaborates with world-known designers to create best-ever unique products for home and this approach gives efficient outcomes. For example, successful joint work of Umbra specialists with Karim Rashid on Garbino Can allowed them to get an award in 1997. If you think you can introduce some creative ideas that will help develop interesting and functional products contact Umbra via e-mail designwithus@umbra.com for further instructions. If your ideas are realized you will get a royalty. Some more detailed information about Umbra collaboration, you can find at the company official web-site. Good luck! One more kitchen appliance in a minimalistic design that will be of great use in any kitchen is Kitchen Houseware Organizer. 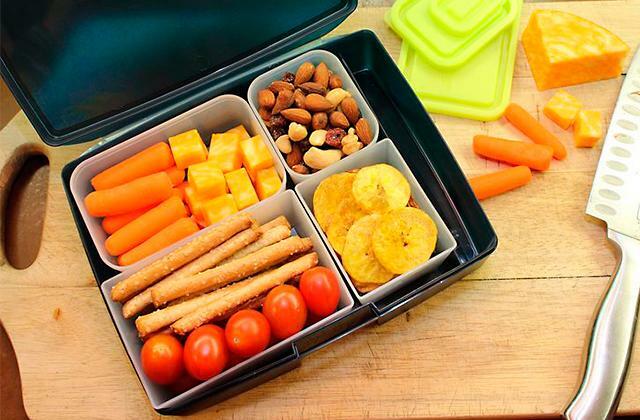 It has 3 compartments to dry and store your cutting boards and cookie sheets. Or you can simply use it to organize your dishes. Rather compact dimensions (11.1"x5.9"x9.2") allow even placing the organizer in a kitchen cabinet. Cooking and eating are an integral part of our life. On a daily basis, we face such task as dishwashing. It does not matter whether we wash the dishes manually or in a dishwasher, there should be a dedicated place in every kitchen to store the dishes and cookware we use every day. And a dish rack is an excellent solution in this case. It is designed not only for drying of plates, cups, and utensils but also for keeping your cookware and glassware at hand. Moreover, today a dish rack is a part of kitchen interior and a decorative element that can become a stylish accent and add to the most exquisite kitchen design. With this simple kitchen appliance, all your utensils and dishes will always remain clean and dry without any food odors and stains. Along with premium cookware, you can’t do without high-quality utensils and cutlery in the kitchen. Hence, we recommend checking our knife sets and steak knives reviews to cook with inspiration and eat with pleasure. While choosing a dish rack for your kitchen, first, pay attention to its Type. There are open or freestanding and built-in models. The major benefit of an open dish rack is that it is a freestanding unit while the built-in model is an element of a cabinet. Another characteristic to distinguish between the dishracks is a Method of Installation. Countertop models are designed to be placed on a countertop or near the sink edge to drain the water and usually, they come with a drip tray. Such dish racks can be also installed in a well-ventilated cabinet to save some space on a countertop. In this case, the cookware will not be in the sight but you should remember that drying plates this way will take more time. The main thing here is a large capacity of your kitchen cabinet. Besides, you can come across in-sink models notable for their compact dimensions, simple, drip-tray free design for convenient installation inside the kitchen sink. These space-saving models are a real catch for small kitchens. 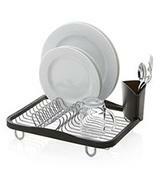 The next essential feature is the number and intended use of Dish Rack Holders. 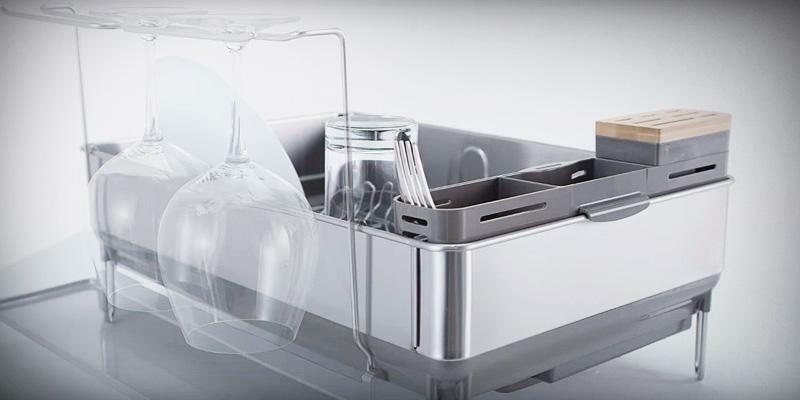 Along with a plate holder, the modern models are fitted with an additional cup holder, utensils holder, and even a knife block or wine glass holder. 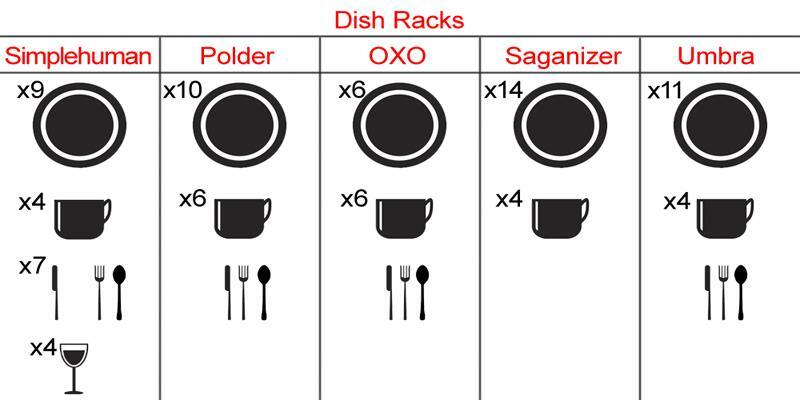 The more holders the dish rack has the more dishes it will accommodate. Currently, the manufacturers use a variety of materials for dish racks but the major criterion is hygienic qualities of the material. For this reason, most models are made of stainless steel and plastic. Such combination of materials prevents molds ensuring long-lasting performance, easy cleaning and versatile design. 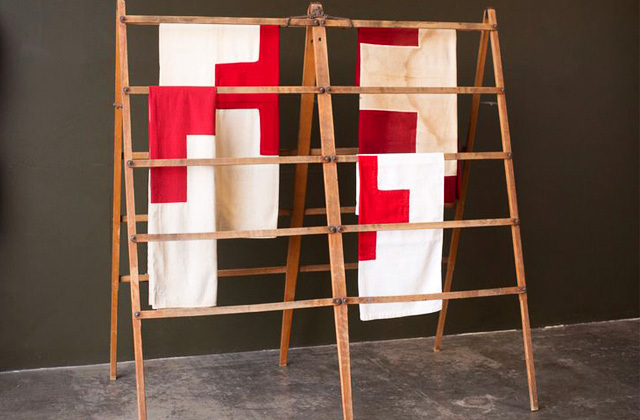 The drying racks can be also made of wood subject to regular treatment with special water-repellant and antibacterial agents. Otherwise, your wooden dish rack will quickly lose its good look and become a source of bacterial growth. Usability is the last but not the least criterion of choice. If you use the unit or appliance every day it should be thought out to the last detail to provide the utmost comfort and convenience. Thus, a special drainage system will allow draining the water from the drip tray directly to the sink. The non-skid rubber feet will prevent not only the rack sliding on the surface but also the risk of scratches on the tabletop or countertop. And finally, for the owners of small kitchens, it is highly important to have compact kitchen gadgets for optimal and efficient space usage. Hence, foldable dish racks will become a handy option allowing for upright unit storage when not in use. 1. The History Behind Your Plate, HubPages. April 7, 2016. 2. Alexandra Sifferlin Washing Dishes is a Really Great Stress Reliever, Science Says, Time. September 30, 2015. 3. Grace Elkus The Surprising Health Benefit of Washing the Dishes, RealSimple. 4. Cari Nierenberg Hand Washing Your Dishes Could Be Better For Kids’ Health, The Huffington Post. February 23, 2015. 5. Joshua Becker Why I Stopped Using a Dishwasher, BecomingMinimalist. 6. Plate (Dishware), Wikipedia. August 29, 2016.